Source: Lloyd Penner, The Mennonites on the Washita River. Bergthal Mennonite Church (General Conference Mennonite), Corn, Oklahoma. In 1894, two years after the Arapaho-Cheyenne Reservation in Oklahoma had been opened to settlement, a group of Mennonite families from Pretty Prairie, Hoffnungsau, and Alexanderwohl communities of Kansas moved into this locality. 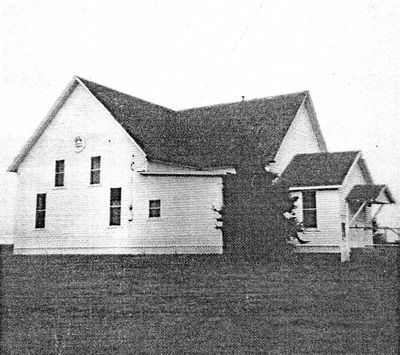 These pioneers had their first meetinghouse near the present site of Shelly schoolhouse, but by 1901 the church had enlarged to such an extent that three separate congregations were created—Bergthal, located two miles (three km) west and three miles (five km) north of Corn, and 15 miles (25 km) southeast of Clinton, and later Herold and Sichar. The 1953 membership was about 86. All of the families from the Pretty Prairie community returned to Kansas so that in 1953 most of the members had their connections in the Hoffnungsau and Alexanderwohl communities in Kansas. Hege, Henry. "Bergthal Mennonite Church (Corn, Oklahoma, USA)." Global Anabaptist Mennonite Encyclopedia Online. 1953. Web. 20 Apr 2019. http://gameo.org/index.php?title=Bergthal_Mennonite_Church_(Corn,_Oklahoma,_USA)&oldid=135759. Hege, Henry. (1953). Bergthal Mennonite Church (Corn, Oklahoma, USA). Global Anabaptist Mennonite Encyclopedia Online. Retrieved 20 April 2019, from http://gameo.org/index.php?title=Bergthal_Mennonite_Church_(Corn,_Oklahoma,_USA)&oldid=135759. Adapted by permission of Herald Press, Harrisonburg, Virginia, from Mennonite Encyclopedia, Vol. 1, p. 280. All rights reserved. This page was last modified on 25 August 2016, at 12:18.